We investigated the influence of altruism on the performance of female residents of long-term care and assisted living facilities who participated in a craft-based occupation. The task involved decorating and filling therapy pillows. Participants who were assigned to the altruistic group donated their pillows to residents of a domestic violence shelter, and those assigned to the nonaltruistic group kept the pillows. 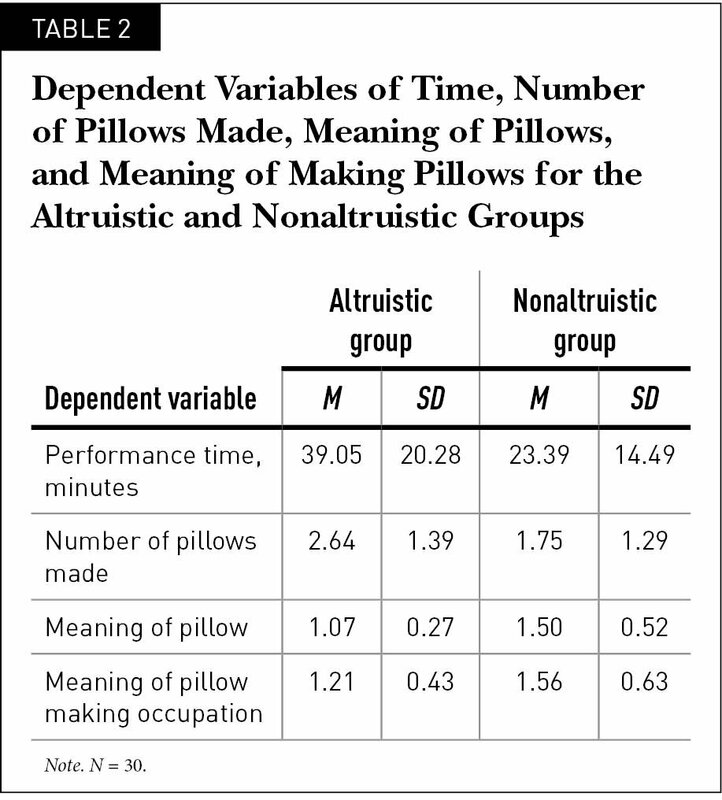 The altruistic group spent more time making pillows (p = .01), made more pillows (p = .03), and rated the occupation as more meaningful (p = .02) compared with the nonaltruistic group. Altruism is considered one of the basic concepts organizing the core values and attitudes of professional occupational therapy (Kanny, 1993). According to Kanny (1993), altruism is unselfish caring for the welfare of others and is reflected in attitudes of commitment, caring, dedication, responsiveness, and understanding. The stated central role of altruism in occupational therapy is underrep-resented in the evidence-based literature; however, the concept of altruism, as it is hypothesized to affect occupational therapy, has been discussed. Some studies have used altruism either as an independent variable or as an integral component. Although altruism is underrepresented in the literature, the connection between self-determination and altruistic behavior has been described. In a comprehensive evaluation of the many facets of self-determination, Deci and Ryan (2000) discussed the need for competence, autonomy, and relatedness. When these are pursued, individuals maintain or increase intrinsic motivation, increase autonomous motivation, and reinforce goals that satisfy basic human needs. As a result, individuals have positive affective experiences, demonstrate high-quality performance, maintain changes associated with healthy living, and show overall better mental health (Deci & Ryan, 2000). Volunteering may have a positive effect not only on society but also on those who provide aid to others (Gottlieb & Gillespie, 2008). Hence, there are similarities in the findings assessing volunteering and altruistic behaviors. Further, altruism is considered a prosocial behavior. Kahana, Bhatta, Lovegreen, Kahana, and Midlarsky (2013) investigated the effect of prosocial orientation on community-dwelling retired elders. Prosocial orientations included altruism, volunteering, and informal improvements in positive and negative outcomes of well-being. A longitudinal prospective cohort study used four outcome measures to evaluate the psychosocial well-being of 585 participants. These included life satisfaction, positive affect, negative affect, and depressive symptoms. They found that an increase in volunteer hours predicted fewer depressive symptoms, improved positive affect, and overall greater life satisfaction. However, altruistic behaviors only predicted improved positive affect. The results show the importance of altruistic behaviors, along with other prosocial behaviors, in promoting life satisfaction and positive affect in the elderly. Matz-Costa, Besen, Boone James, and Pitt-Catsouphes (2014) evaluated the effect that differing levels of engagement in volunteering, paid work, and caregiving had on psychological well-being among adults 50 years and older (mean age, 62.2 years). Participants completed surveys on psychological well-being and role engagement as well as a work engagement scale. The findings showed greater psychological well-being among those who had high levels of engagement in volunteering activities compared with those who had medium or low levels of engagement. For caregiving, the results indicated a higher level of psychological well-being among those who had medium levels of engagement compared with those who had either high or low levels of engagement. Therefore, participants who had the highest levels of psychological well-being were highly engaged in volunteer activities and moderately engaged in caregiving (Matz-Costa et al., 2014). These results suggest that techniques to promote high levels of engagement in volunteering among the elderly may increase their overall psychological well-being. Okun, Rios, Crawford, and Levy (2011) sought to understand the relationship between volunteering and well-being with regard to health and age. With the use of cross-sectional data from the 2008 Arizona Health Survey (Arizona Health Survey, 2008), participants (N = 4,161; mean age, 56.45 years) were assessed on two aspects (positive and negative) of subjective well-being and one aspect (resilience) of psychological well-being. Health was evaluated by whether a physician had ever diagnosed the participant with any of the following conditions: asthma, diabetes, high blood pressure, heart disease, arthritis, gout, lupus, fibromyalgia, or a digestive disorder. The findings showed no relationship among age, volunteering, and well-being (positive, negative, or resilience). However, statistically significant results showed that, as the number of chronic health conditions increased, positive affect and resilience scores increased with volunteering. To determine the effect of volunteering on social life, Pavelek (2012) interviewed 30 participants (15 senior volunteers; 15 representatives from nongovernmental organizations). The study used a qualitative analysis and grounded theory approach of thematic analysis, and a number of themes emerged. As expected by Pavelek (2012), no participants experienced negative emotions as a result of volunteering. Additionally, volunteering was perceived to increase lifelong learning and promote productive aging. Finally, volunteering was associated with positive quality of life for seniors. Specifically, it decreased the sense of inferiority that can lead to depression, loneliness, and a feeling of uselessness. Therefore, the findings suggest that volunteering improves quality of life for seniors (Pavelek, 2012). Finally, an earlier study by Rice (2002) examined altruism among a population of elderly women in skilled nursing facilities (N = 33). Participants were referred to the study after they achieved a score of 25 or more on the Para-check Geriatric Rating Scale (Paracheck & King, 1976), so only individuals who scored above a particular cognitive level were included. Each participant was randomly assigned to one of eight groups. Four of the groups made stationery for children who had been abused, stenciling the children's initials on the paper. The other four groups made stationery personalized with their own initials. Participants were given as many breaks as they desired. A strong emphasis was placed on the children who would receive the stationery. For example, the participants were shown pictures of the children. They were also given frequent reminders of the meaning of the occupation, according to a script provided by the researchers, including comments about how much the children needed the stationery to write to friends and family. Analyses of both the quantity of stationery produced and the amount of time spent creating the stationery showed that participants engaged for a significantly longer time and made more pieces of stationery when the product was made for abused children than when they kept the stationery for themselves. This study supported the importance of altruism as a motivating factor for participation in a craft-type occupation. The findings are inconclusive on the efficacy of using altruism as a motivating factor for participation in occupations. A central tenet of occupational therapy is that the amount of meaning (personal relevancy) that an individual attributes to an occupation affects the amount of purpose (motivation) that the individual has for the occupation. Consequently, participants exert greater effort when they consider an occupation meaningful than they do when they consider the occupation meaningless (Nelson & Jepson-Thomas, 2003). Many earlier studies of altruism used occupational forms that are assumed to have greater meaning, but the effect of altruism on performance is inconclusive. Although the studies discussed earlier support the benefits of altruism on human behavior (Kahana et al., 2013; Matz-Costa et al., 2014; Okun et al., 2011), the evidence is not conclusive. In other words, despite our current state of knowledge, we still do not have a firm understanding of how altruism may affect performance. Additionally, our study incorporated the level of meaning associated with the occupation expressed by the participants, a new area of investigation. Our study investigated the effect of meaning on performance as a function of both the meaning attributed to an occupation and participants' view of the occupation as altruistic. Elderly women living in long-term care or assisted living facilities were recruited to participate in a task either to benefit others (altruistic) or to benefit themselves (nonaltruistic). We measured the number of pillows produced, the amount of time that the participants engaged in the occupation (total time and time per pillow), and the meaning that the participants attributed to the occupation. Participants in the altruistic group will perform the altruistic task longer, as measured with a computerized stopwatch, and make a greater number of products. Participants in the altruistic group will attribute a higher level of meaning, defined with a 3-point Likert scale, to the product than participants in the nonaltruistic group. Participants in the altruistic group will attribute a higher level of meaning, defined with a 3-point Likert scale, to the occupation than participants in the nonaltruistic group. The sample included 30 women who were 65 years or older and lived in long-term care or assisted living facilities. Women were chosen as participants in part because the nature of the intended recipients (i.e., women and children living in a domestic violence shelter) and the type of craft (i.e., therapy pillows) for the altruistic condition were assumed to be compatible with older women. Participants were recruited from long-term care and assisted living facilities from northwestern Ohio. Once the investigators were given permission to conduct the study at a facility, a staff member from the facility identified residents who would be appropriate for the study and asked them if they would like to learn more about participating. The staff member gave the names of residents who agreed to participate to the investigator, who then met with the interested residents to explain the study and provide materials for completion of the therapy pillows. The following materials were used: (a) fabric pens, (b) white fabric sewn into 4 × 5 inch pockets, (c) templates, (d) rice, (e) a funnel, (f) a bucket, (g) a sewing machine, (h) a stopwatch, and (i) a questionnaire. 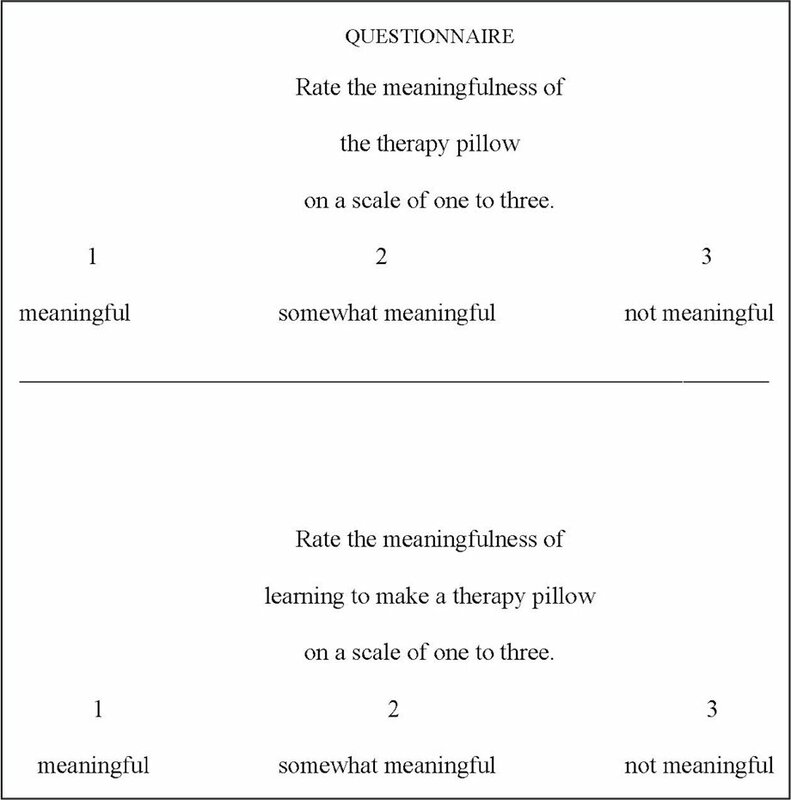 The questionnaire, which was designed to measure the meaning that participants attributed to the occupation, included questions about how much the therapy pillow meant to the participant and how much learning to make the therapy pillow meant to the participant (Figure1). The rationale for this measurement was to identify the level of meaning that participants attributed to both the occupation and the product as well as to investigate differences between levels of meaning reported by participants in the altruistic group and the nonaltruistic group. A custom software program was used to track the time spent on the task and the number of pillows completed. This occupation was age-appropriate, regardless of whether the participant kept the pillow or donated it. Therapy pillows were potentially useful for elderly women, younger women, or children. The product, a decorated pillow filled with rice, weighed approximately 1 pound and measured 4 × 5 inches. The performances for this study included drawing on the fabric and stuffing the pillow with rice. This brief occupation was practical in terms of time and expense. In addition, because the pillows were small, a person could use more than one. This study was approved by the biomedical institutional review board of the sponsoring university. Before any data were collected, informed consent was obtained. Participants were randomly assigned to either the altruistic group or the nonaltruistic group. A custom software program was used to randomly assign participants to groups in a permutated blocked fashion that used two blocks of four sessions and four blocks of three sessions. Specifically, the group section (altruistic or nonaltruistic) was randomly assigned. Both groups received an explanation of how the therapy pillows would be used, including heat therapy, positioning, or as part of a game. Members of the nonaltruistic group were given the completed pillows to keep. Members of the altruistic group were told that the investigator would give the completed pillows to women and children who had experienced domestic violence and were living in a local shelter. These recipients were chosen because it was thought that they would be viewed as legitimately in need of help. The altruistic group was instructed to decorate and fill therapy pillows for women and children who had experienced domestic violence. A description of the mission of the shelter where the women and children lived was given or read to the participants, and the investigator explained that the completed pillows would be delivered to the shelter. The nonaltruistic group was instructed to decorate and fill therapy pillows to keep for themselves. Participants were seated at tables in groups of up to four, according to the order in which they arrived. All of the participants at the same table were in the same group. Group size was limited to four to optimize instruction. Each group was given the same set of instructions. The occupation consisted of two steps: (a) decorating the empty pocket with fabric pens and (b) filling the pocket with rice. Once the pocket was filled, it was sewn shut by the investigator, and an additional pocket was offered to the participant. If participants asked how long they should continue making the pillows, they were told to continue as long as they would like. When participants stopped performing the occupation, they were given a verbal (closure) prompt: “Would you like to continue making pillows for yourself/child/woman?” If the subject answered “no,” then a second and final verbal (closure) prompt was given: “Are you sure that you do not want to make another pillow for yourself/child/woman?” If the participant answered “yes,” then the duration of occupation was recorded. If the participant answered “no” to the verbal (closure) prompt, then the activity was resumed. Participants were allowed rest periods. Time was recorded at the beginning and the end of each rest period. If the participant appeared fatigued, then a rest was suggested: “Are you tired? You may take a rest if you would like one. Go ahead and rest for a moment.” After 1 minute, the participant was asked, “Are you ready to work again?” If the participant did not want to reengage in the activity, then the previously mentioned verbal (closure) prompts were used. The occupation took place at the facility where the participants lived and at approximately the same time of day for each group. Nonparticipating residents were not present in the room. A simple experimental design was used. Dependent variables included the time spent working on the pillows (measured with a digital stopwatch), the number of pillows made (recorded on the same form as the time record), and questionnaire scores. The questionnaire scores were assessed with a 3-point Likert scale to determine the meaning that participants attributed to the occupation and to learning to make the product (Figure1). Cohen's (1988) effect size d was calculated for each comparison. 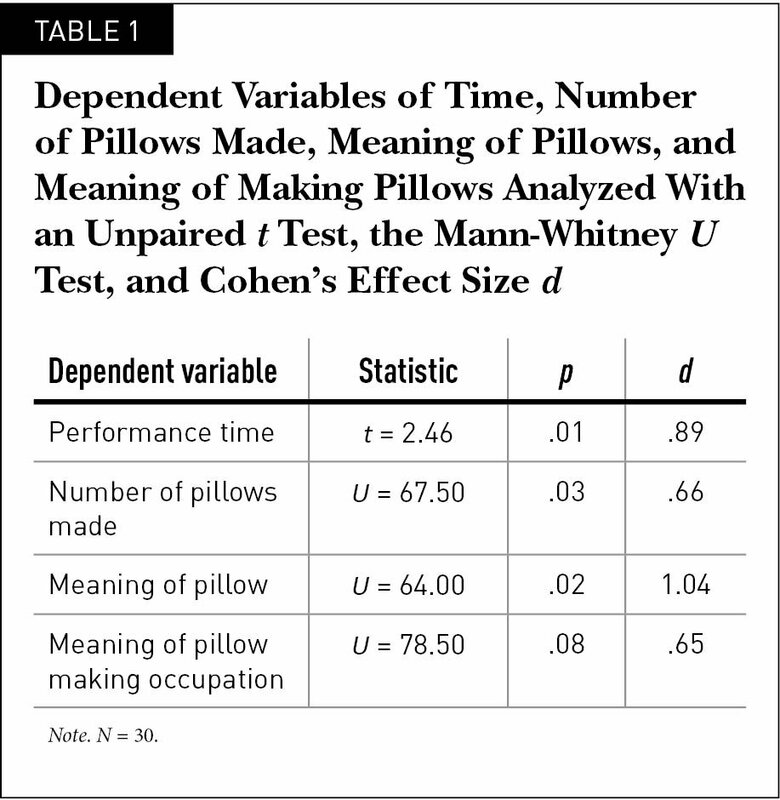 Nonparametric measures (Mann-Whitney U test) were used for ordinal data (i.e., number of pillows made, measures of meaning), and parametric measures (t test) were used for continuous data (i.e., time). The variable distributions of time, the number of pillows made, the meaning attributed to the therapy pillow, and the meaning assigned to learning to make the therapy pillow were analyzed. All of the hypotheses were supported by the results, except one dependent variable, the meaning attributed to learning to make the pillow. Hypothesis 1, “Participants in the altruistic group will perform the altruistic task longer, as measured with a computerized stopwatch, and make a greater number of products,” was supported by the results. Table 1 shows a summary of the following data. Comparison of performance time between the two groups showed a significant difference (p = .01), with the altruistic group spending more time making pillows (M = 39.05 minutes) than the nonaltruistic group (M = 23.39 minutes). This difference yielded a large effect size. A significant difference also was seen between the two groups in the number of pillows made (p = .03), with the altruistic group making more pillows (M = 2.64) than the nonaltruistic group (M = 1.75), yielding a medium effect size. Hypothesis 2, “Participants in the altruistic group will attribute a higher level of meaning, defined with a 3-point Likert scale, to the product than participants in the nonaltruistic group,” was supported by the findings. A summary of the following information is shown in Table 1. A significant difference (p = .02) was found between the altruistic and nonaltruistic groups, with the altruistic group indicating higher levels of meaning (M = 1.07) in relation to the pillow than the nonaltruistic group (M = 1.50). The effect size for this dependent variable was large. Hypothesis 3, “Participants in the altruistic group will attribute a higher level of meaning, defined with a 3-point Likert scale, to the occupation than participants in the nonaltruistic group,” was not supported, as shown in Table 1. The difference between the two groups was not significant (p = .08). The altruistic group indicated a trend toward finding the occupation meaningful (M = 1.21), and the nonaltruistic group indicated a trend toward finding the occupation somewhat meaningful (M = 1.56). The effect size was medium. Means and standard deviations of the dependent variables for the altruistic and nonaltruistic groups are shown in Table 2. Our study investigated the effects of altruism on the performance of elderly women living in long-term care or assisted living facilities. The findings that elderly female participants performed better when they were told that the products they made would go toward an altruistic cause replicate earlier findings (Rice, 2002). In addition to the time spent on the occupation and the number of items produced, we investigated the meaning that the participants attributed to both the product itself and to learning to perform the occupation of making the product. These results support the experimental hypotheses that participants would spend more time on the occupation, create more products, and attribute more meaning to the product when they were part of an altruistic group compared with a non-altruistic group. The hypothesis that participants would attribute more meaning to the occupation when they were part of the altruistic group as opposed to the nonaltruistic group was not supported. It is likely that those in the altruistic group perceived their social contribution, in the form of donating pillows to a shelter, as greater than the social contribution perceived by those in the nonaltruistic group, who kept the pillows. Nelson and Jepson-Thomas (2003) postulated that an individual's perception of potential social success has a beneficial effect on meaning, purpose, and subsequently performance. In addition, Rice (2002) found that more residents of a long-term care facility attended an altruistic occupation. The findings of Kahana et al. (2013), Matz-Costa et al. (2014), and Okun et al. (2011) also supported the benefit of altruism, showing better health in elders who perceived their social contribution as greater than the support they received compared with those who perceived that they received more support than they contributed. The ideas of Nelson and Jepson-Thomas (2003) about social success are supported by our finding that performance improved when participants were part of a group that gave the product of their efforts to others in the community. In our study, making the pillows may have represented making a successful contribution to society for those in the altruistic group; therefore, those in this group may have performed the occupation with a higher degree of purpose, as evidenced by more time spent, more pillows produced, and greater meaning regarding the pillows compared with the nonaltruistic group. This may be the case, especially for the time spent constructing the pillows and the meaning associated with the pillows, because both of these had large effect sizes. The increased meaning associated with the pillows in the altruistic group suggests that these participants felt better about their productivity than those who simply produced pillows for themselves. Our findings suggest that including an altruistic component in occupational therapy interventions may increase the performance of elderly women living in long-term care and assisted living facilities. These findings support the idea that older women experience enhanced meaning and perform better when altruism is added to an occupation. Those who are more engaged in occupational therapy because altruism has increased both the meaning and the performance of the occupation may experience greater therapeutic benefits compared with those who engage to a lesser degree because they do not attribute meaning to the occupation. As a result, those who do not attribute meaning to the occupation have subsequent decreases in performance and fewer functional gains. An altruistic occupation may be ideal for elderly female residents of long-term care or assisted living facilities who decline participation in occupational therapy or participate half-heartedly. Some residents of long-term care or assisted living facilities may feel disconnected from society, and altruism is an effective way to engage them in therapy by adding meaning to the benefits gained from performing occupations in the form of social success. The added benefit of occupational therapy for these individuals may be a sense of competence based on the knowledge that their contributions are useful and valued by others in the community. The ability to engage in altruism is a skill retained by elders who may experience age-related impairments, and it provides a valuable tool to help occupational therapists to elicit participation. Occupational therapists also may find increased meaning in work that benefits the community as well as an individual patient. Although efforts have been made to isolate the variable of altruism, other causes, such as peer pressure from other participants, may be responsible for some of the effects. Our findings may not be generalized to populations beyond elderly women living in long-term care and assisted living facilities in northwestern Ohio. Further study of the effects of altruism on occupational performance with male participants is warranted. Because data collection occurred only with participants in groups, future research should assess the performance of single participants to control for group effects. We found that altruistic giving of community support increased participants' performance and the perceived meaning of the product. Participants in the altruistic group reported enhanced meaning associated with their products, which may have enabled greater engagement in the performance of the altruistic occupation. This finding is potentially useful for occupational therapists who wish to engage clients in a task. Although the goal of occupational therapy may be direct benefit to the health of the individual, our findings suggest that elderly women living in long-term care and assisted living facilities may be more motivated by helping others. Increasing performance is always a priority for occupational therapists, whether the individual's goal is to regain health and wellness, help others in the community, or a combination of these. We found that addressing the need to contribute to the community is one way that an occupational therapist can increase the performance of elderly women living in long-term care and assisted living facilities. Arizona Health Survey. (2008). Design and methodology of the Arizona Health Survey. Phoenix, AZ: St. Luke's Health Initiatives. Nelson, D. L. & Jepson-Thomas, J. (2003). Occupational form, occupational performance, and a conceptual framework for therapeutic occupation. In Kramer, P., Hinojosa, J. & Royeen, C. B. (Eds. ), Perspectives in human occupation: Participation in life (pp. 87–155). Philadelphia, PA: Lippincott Williams & Wilkins. Paracheck, J. F. & King, L. J. (1976). Paracheck geriatric rating scale (2nd ed.). Scottsdale, AZ: Greenroom. Rice, C. G. (2002, June). The effects of altruism on productivity in elderly women in skilled nursing facilities. Poster session presented at the 13th World Federation of Occupational Therapists. , Stockholm, Sweden. .
Dr. Masri is Occupational Therapist, El Camino Hospital, Behavioral Health Services, Santa Cruz, California. Dr. Rice is Professor and Dean, School of Health Sciences, Indiana Wesleyan University, and Dr. Foster is Program Director, Graduate Athletic Training, School of Health Sciences, Indiana Wesleyan University, Marion, Indiana. Dr. Miller is Dean and Professor, University College, The University of Toledo, Toledo, Ohio. This scholarly work was completed as partial requirement for the degree of Occupational Therapy Doctorate for the first author from The University of Toledo. Address correspondence to Martin S. Rice, PhD, OTR/L, FAOTA, Professor and Dean, School of Health Sciences, Indiana Wesleyan University, 4201 South Washington Street, Marion, IN 46953-4974; e-mail: martin.rice@indwes.edu.